If one has the pleasure of auditioning a pair of two-way, stand mounted Triumph Signature Extremes, I strongly, strongly recommend inquiring if these speakers h ave been fully broken in. In my listening room it took at least two hundred hours (for those who do not want to do the math this equals more than eight days of continuous use) before they even began to sound their best. Before that time the frequency extremes did not approach anywhere near their full potential, and their overall sound was rather un-involving. 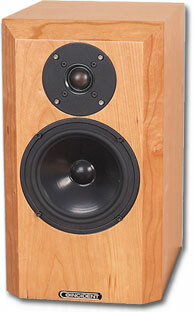 When they finally settled in they morphed into one of the most responsive pieces of hi-fi equipment I have ever heard — that is, these speakers from Coincident Speaker Technologies (CST) were almost totally dependent on upstream components, and especially the quality of the recording, in determining their sound. Even the most seemingly insignificant change in set-up, a recording's attributes (or lack thereof), or the arrangement of associated gear was audible. Lest one think that this would be a liability when listening to less than perfectly recorded material, because these extremely speedy and transparent speakers are also some of the most musical two-ways I've heard, letting the quality of the recorded performance shine through — and since you and I only listen to good music (naturally) the content of the recordings compensated for any deficiencies in a disc's production.